Why release one big, dark, boozy beer for winter when you can release two? 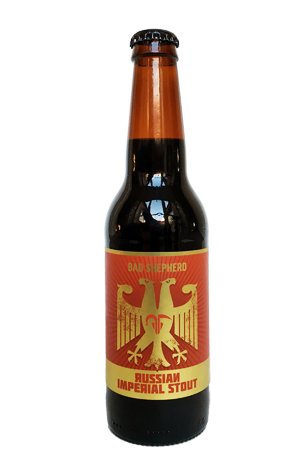 That seems to be the approach at Bad Shepherd, where they're embracing all things intensely malty as the mercury plummets – releasing this Russian Imperial Stout at the same time as their gold medal-winning Baltic Porter, thus adding further to the darkness offered by the Hazelnut Brown Ale in the core lineup and regular winter seasonal Oatmeal Stout. This, however, is the biggest of the lot, tipping the scales at just over 10 percent ABV, yet isn't as bolshy as one might expect. Indeed, for such a big beer it's relatively light on the palate, a far cry from some of the sweeter, more voluptuous imperial stouts on the market. Bad Shepherd's sits very much at the dry, roasty, espresso end of the spectrum aroma wise with the dark fruit and chocolate sweetness characters making a fleeting appearance before an earthy, roasted bitterness settles in. An austere rather than flamboyant emperor.